I love makeup just as much as the next girl. Just not so much in the summer. ? There’s nothing fun about watching your beautiful masterpiece come together and then slide right off the second you walk outside. So tragic! You can always summer-proof your makeup routine by adding a matte primer, setting spray and switching up your foundation. Me? I like to keep it simple most days with minimal makeup for a fresh, radiant look that’s effortless and heat-proof. That’s what June was all about! Concealers always tend to crease on me. Always. So I wasn’t expecting much at all from the new Wet n Wild Photo Focus Concealer. Especially after a few people told me this stuff creases like crazy. “Great!” I thought. Yet another concealer that’s gonna have me looking cakey, crazy and crusty by the end of the day. To my surprise, the Wet n Wild Photo Focus Concealer was the exact opposite. I actually love this stuff! The Wet n Wild Photo Focus Concealer is very creamy with buildable light to medium coverage and a satin finish. The formula is perfect for my dry eyes! Which is why it quickly became one of my faves. The Photo Focus Concealer is nice and creamy so it doesn’t cling to any dry spots or flakes. But it’s not too creamy (and emollient) that it’s sliding all over the place and creeping into my fine lines by the end of the day. A light dusting of my beloved Black Opal Deluxe Finishing Powder and I’m good to go all day! Bronzer is a summer essential! Yup. Even chocolate cheeks need a little bronzer! I recently hit pan on holy grail Bobbi Brown bronzer so I figured it was time to try something a little different and cheaper. The BareMinerals Invisible Bronze is new to the scene but a staple in my routine now. The new BareMinerals Invisible Bronze is sheer yet buildable so it’s easy to look naturally sun-kissed or ultra-bronzed. The formula is incredibly easy to blend and pretty much undetectable so Invisible Bronze never looks overdone or too “made up”. I have to give Bare Minerals a pat on the back for including a Dark to Deep shade that’s actually suitable for chocolate cheeks. It’s a struggle finding non-shimmery bronzers for brown skin but BareMinerals has certainly nailed it! A subtle highlight is key to looking naturally radiant. So it’s not surprising that I’ve been reaching for the Too Faced You Light Up My Life Prismatic Highlighter often these days. Strong golden highlighters work best for my skin tone so You Light Up My Life is the perfect summer highlighter for me. It’s not too shimmery or chunky so it’s great for my “no makeup” looks. A quick sweep of You Light Up My Life across my cheekbones, cupid’s bow and down the bridge of my nose instantly brightens my face without looking dramatic. However, I can still layer it on for that poppin’ highlight effect I love when I’m all glammed up. You Light Up My Life is easily one of my top summer faves! Foundation and moisturizer all in one? Yes, please! There’s nothing more convenient than being able to moisturize and even out your skin tone all at the same time. The new Philosophy Renewed Hope in a Jar Skin Tint has made my morning routine a breeze! The Renewed Hope in a Jar Skin Tint offers buildable sheer to medium coverage that’s best suited for normal to dry skin. I love this stuff because it’s hydrating enough for my dry skin yet also saves me a ton of time by skipping foundation. I can easily apply a little bit for smooth, even light coverage. Or I can up the ante and add a few drops of the NYX Total Control Drop Foundation to maximize the coverage. The Philosophy Renewed Hope in a Jar Skin Tint is another one of my top summer faves! Running out of cotton pads is a major disaster when you’re toner obsessed. Thankfully, I had the new Mario Badescu Facial Spray with Aloe, Cucumber and Green Tea on hand to hold me over. Call me crazy but I actually like this stuff as a toner! The Mario Badescu Facial Spray with Aloe, Cucumber and Green Tea is lightly hydrating yet extremely refreshing and cooling. Making it the perfect facial spray for hot, muggy days! After a spritz (or two) of Mario’s Facial Spray, my skin feels invigorated, hydrated, refreshed and ready to soak up some good skincare. 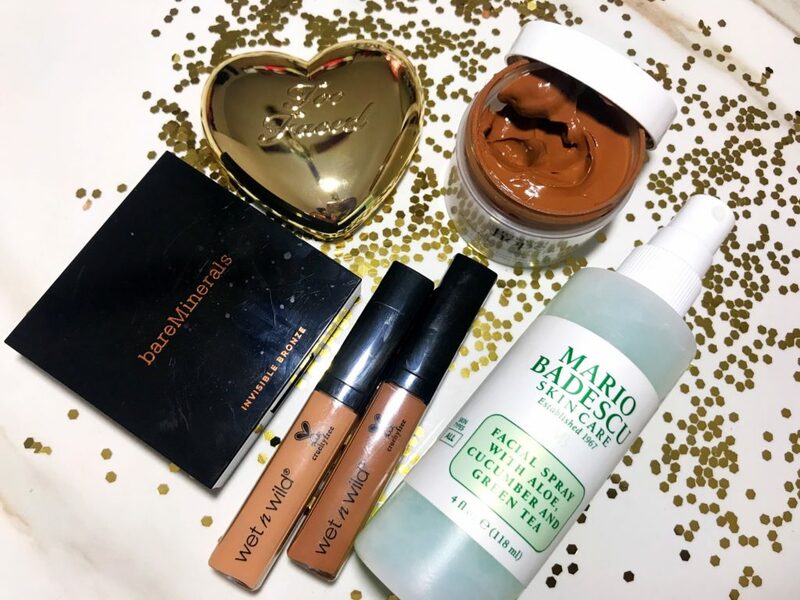 I’ve noticed that my skin feels and looks so much smoother and even brighter since using the Mario Badescu Facial Spray with Aloe, Cucumber and Green Tea. I highly recommend it!